We’ve been very busy this season with growing plants for RHS show gardens. 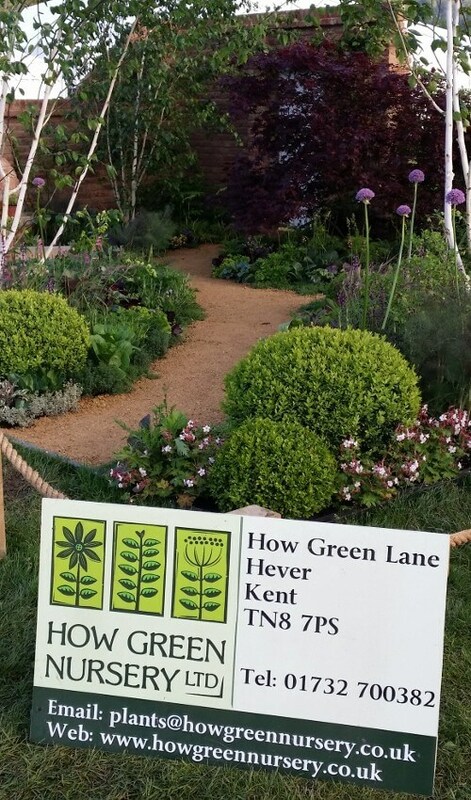 Our band of merry garden design customers have taken on the challenge of designing, building and planting at some of the countries most prestigious shows! First up, our good friends Richard and Sam from Twigs garden design based in Sussex approached us to grow for their ‘A Fruity Story’ garden at Malvern. The concept of the garden was based around a realistic, fully functional garden that can inspire people to do the same at home! The emphasis being on cooking, with the installation of a beautiful brick fire kiln. The planting also tied in nicely, with many herbs, vegetables and soft fruit that could be used directly in conjunction with any cooking done in the garden. Planting was not in the conventional way in lines, but blending in with herbaceous perennials and grasses. To soften the wonderful landscaping, Richard and his team used a wonderful pallet of shade loving plants to under-plant the stunning Betula and Acers. They deservedly won a Silver-gilt medal which is a great achievement guys! With several celebrities including chef James Martin enjoying the garden and a slot on Gardeners World last Friday, I’m sure Twigs will go from strength to strength! Next week, check out our post on how our growing for the Chelsea Flower Show went! We open our gates and welcome the public for the first time this year! Following the success of the last couple of years public open weekends, we’re again giving you more of the same in 2014! Our strictly wholesale nursery, runs three exclusive public open weekends throughout the season. Our first just so happens to be this coming weekend. Dates for your diaries are Saturday 12th & Sunday 13th April. Browse our entire nursery, with over 4000 different plants including perennials, grasses, alpines, herbs, vegetables & soft fruit, potted bulbs, patio plants, topiary and a few select shrubs. We grow the usual garden favourites, but specialise in brand new introductions, especially within our perennial range. If that all sounds too much for you, relax in our summer house where we will be serving delicious home made cakes and teas. Expect a warm welcome from us all (including nursery dogs!) and there will be plenty of knowledgable staff on hand to help with any questions! Public Open Days 6th & 7th April! We’re all getting a little excited here at How Green, as all roads lead to the nursery next weekend with our first public open days of the year! Due to phenomenal demand, the very special, limited public days are back! 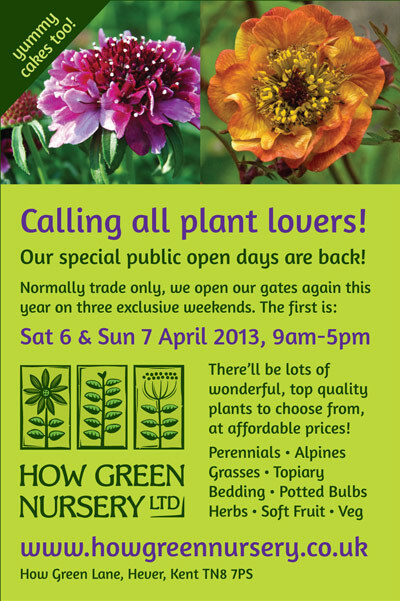 The strictly wholesale nursery throws open it’s gates on Saturday 6th & Sunday 7th April. 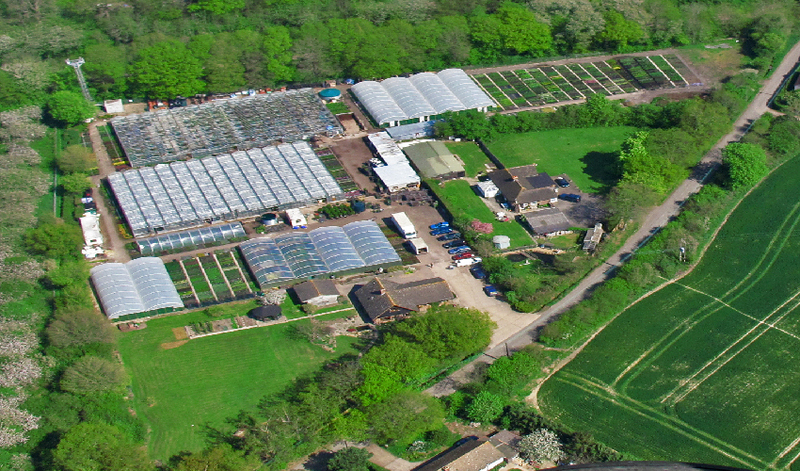 Come and wander round our six acre, plant packed site, offering nearly 4000 different perennials, grasses, alpines, herbs, vegetable plants, soft fruit, patio plants, potted bulbs and topiary. We specialise in introducing the most up-to-date, must have plants, as well as traditional garden favourites. 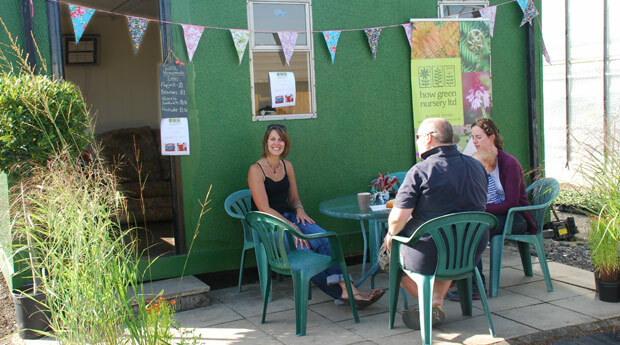 A warm welcome awaits all and there will be expert advice on hand on both days, and if being bamboozled by so many plants becomes too much, relax in our Summerhouse with a well earned cup of tea & home made cake! 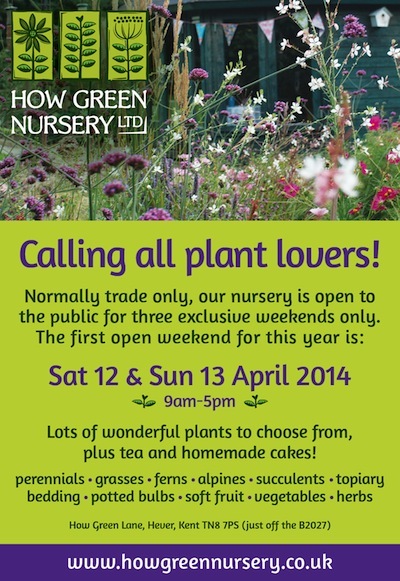 This year for the first time, How Green Nursery are running a series of trade only days! Those of you who already use us will know that you are more than welcome to visit the nursery at any time throughout the season. What makes these days different, is that we are offering some very special rates, but only on orders taken on the day. Browse the nursery at your leisure and check out our stock that totals nearly 4000 different plants! A warm welcome awaits you, with wagging tails from the nursery dogs and if you’re lucky, tea and biscuits! So if you are in the trade, a garden designer/landscaper, garden centre owner or plant nut in the trade, pop along and see us on Friday 8th & Saturday 9th March! These are strictly trade only days and will not be open to the public. Fear not! Those of you not in the trade, look out for our special, very limited public open weekends! Check us out for further details nearer the event.